Any competitor interested in posting their regional competition performance on YouTube, social media, or their website must have Sweet Adelines International’s written permission before posting and sharing. Please complete this survey for permission. I think most of you were aware that our entire organization was asked to cast one ballot per region on whether or not SAI continues with the Regional Governance Model. Our region has been operating under the model for the past two years. Region 4’s vote was unanimously in favor of continuing. Congratulations to HHR4 members with longevity milestones in 2019! Make sure to look for your names on the Big Screens at contest this year. Well-established chorus in Delaware, Ohio is looking for a musically talented and organized front line director. We have frequent performance opportunites in our community and surrounding areas. We are well respected singing at our current level and desire a leader to grow, encourage, and move us to the next level. We are a mature, fun, committed, harmony loving, family oriented small chorus. If you are interested in this opportunity, please contact us at www.ohioheartlandsings.org or post on our Facebook page. HHR4 In St Louis & More! 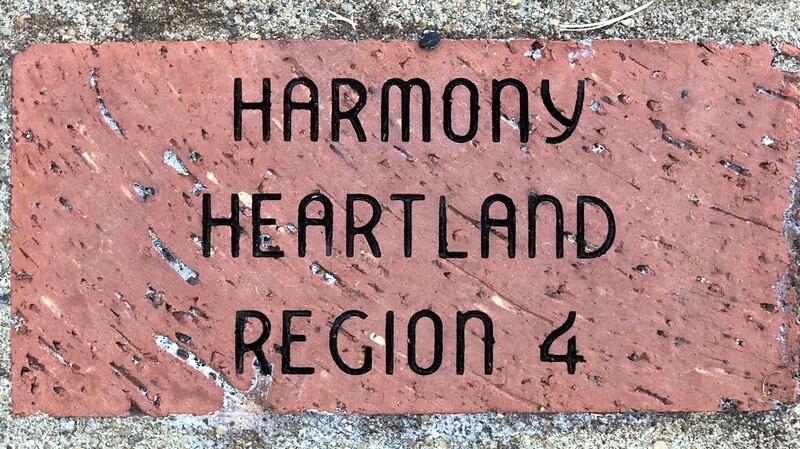 Congratulations to everyone who crossed the stage this October in St Louis, and most especially to the members of Harmony Heartland Region 4. We are so very proud of you! Metro Nashville Chorus was also honored with the Harmony Achievement Award! Let's shower them with love gifts at Fall Fling! Special bags for gifts can be found in The Hub. For information about monetary gifts, please see here. Contest scores are now available in the Members Only section of our website, here. Not a member of Region 4, but still curious about scores? Keep an eye out on the SAI website! They'll post all regional scores there, too.